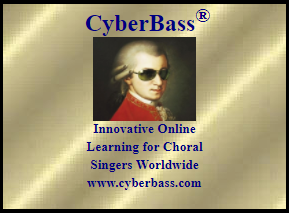 Choralia is a website that provides practice tracks for choral pieces. Each part includes synthesized words to help you keep your place. Choralia doesn't charge for the download of their tracks like Cyberbass does. If you choose to download their free tracks and want to show them your appreciation, they do have a donation page. ​Rehearsal tracks for each voice part, when available, are uploaded to the Chorus' Google Drive in MP3 format. A limited number will be available in CD format at rehearsal. Click the image to the right (or below, if on your phone or tablet) to be taken to the folder. If you download these tracks, you can burn them to a CD to play in your car, load them onto your iPod, or just play them over and over without needing to stream (download) them from the internet each time. You can download multiple tracks at once, they will just need to be unzipped afterward. Select your voice part on the line next to the track you wish to practice. This will load the track into the player. If the music does not begin automatically, press the Play button on the music player in the middle of the page. Using the controls below the music player, you can slow down the tempo of the track if you need to. These tracks have "words" (generated by the MIDI software that made the track, so they do sound funny) and may be downloaded free of charge.